Playa Popoyo, Nicaragua, June 6, 2015 - The 2015 Nicaragua Unica... Original ISA World Surfing Games presented by Lafise and Claro kicked-off an exciting weekend of competition finals on Saturday. Outstanding matchups took place in the Repechage Rounds, before the ISA Aloha Cup closed out the day of nation-oriented camaraderie. "I am super stoked and happy to make it through, we need the points. The race for the title is getting harder and harder for us," voiced Muñoz. "My strategy to reach the final is to save energy, relax, use the spirit of the team and keep having fun. It's just Surfing. Pura Vida!" In the first heat of the Women's Repechage Round 6, New Zealand's Paige Hareb notched the first 10-point ride of the 2015 ISA World Surfing Games en route to her heat victory. Still, it was Costa Rica's Leilani McGonagle that stole the attention of the day defeating 2014 Gold and Bronze Medalists Anali Gomez (PER) and Philippa Anderson (AUS). Playa Popoyo, Nicaragua, June 4, 2015 - Day 4 of the 2015 Nicaragua Unica... Original ISA World Surfing Games featured male and female Main Event and Repechage Rounds. Surfers continue to surf hard representing their nations while the field of medal contenders narrowed. Costa Rica's Leilani McGonagle took advantage of the morning offshore wind and posted the highest heat score of the day for the women's division. McGonagle scored 16.27 in her heat victory, and moved one step closer to the Women's Final. "I am super stoked to have made that heat! The waves were super fun," commented Costa Rica's Leilani McGonagle. "I love this event because the teams are so supportive of one another. I really feel like my team is always on the beach screaming. We're like family." Ian Crane tearing apart the lip in the offshore winds of Playa Popoyo en route to a heat win. Playa Popoyo, Nicaragua, June 1, 2015 - The 2015 Nicaragua Unica... Original ISA World Surfing Games presented by Lafise and Claro got off to an impressive start on the event's Opening Day. As predicted by Surfline, the official forecaster of the event, the ocean offered consistent chest to head high sets throughout the day allowing the competitors to display their world-class talent. The conditions were clean as Nicaragua's infamous offshore winds blew lightly from dawn until dusk. "The first round was absolutely amazing! A south swell and perfect offshore wind made for a great opening day," said ISA President Fernando Aguerre. "Seeing all the athletes on the beach cheering and surfing in the name of their countries was really special. The sportsmanship and team camaraderie is truly a unique feeling that only an ISA World Championship provides. I look forward to seeing athletes perform when the solid and larger swell arrives to Nicaragua in the middle of the week." 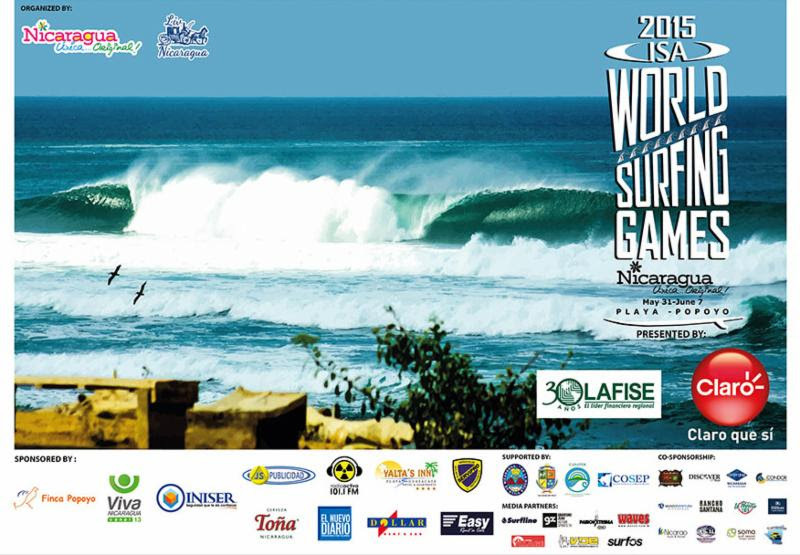 Playa Popoyo, Nicaragua, May 29, 2015 - On Friday, May 29, the 2015 Nicaragua Unica Original ISA World Surfing Games presented by Lafise and Claro official press conference took place in the Hilton Hotel in Managua, Nicaragua. Representatives of Nicaragua's leading TV, print and online media outlets filled the Press Conference room and posed questions to Nicaraguan Dignitaries as well as members of the Nicaragua's National Surfing Team. ISA President Fernando Aguerre opened the forum saying, "I'm glad to return to Nicaragua because it's a country with exceptional waves, which are a resource that will never run out. It's the most renewable natural resource that truly doesn't require any human activity. It's simply taking care of the coast and the beaches to take advantage of those waves." La Jolla, California, May 21, 2015 - From May 31st to June 7th, the top surfers in the world will gather in Playa Popoyo, Nicaragua, for the 2015 ISA World Surfing Games. The competition will be held at a one of the most renowned breaks in all of Nicaragua. These are the ten things you need to know about the 2015 ISA World Surfing Games. The 2015 ISA World Surfing Games will gather over 25 National Delegations from every corner of the world, who will gather to compete for their National Team in an "Olympic-Style" event. The surfers compete for medals and the honor of representing their respective countries. 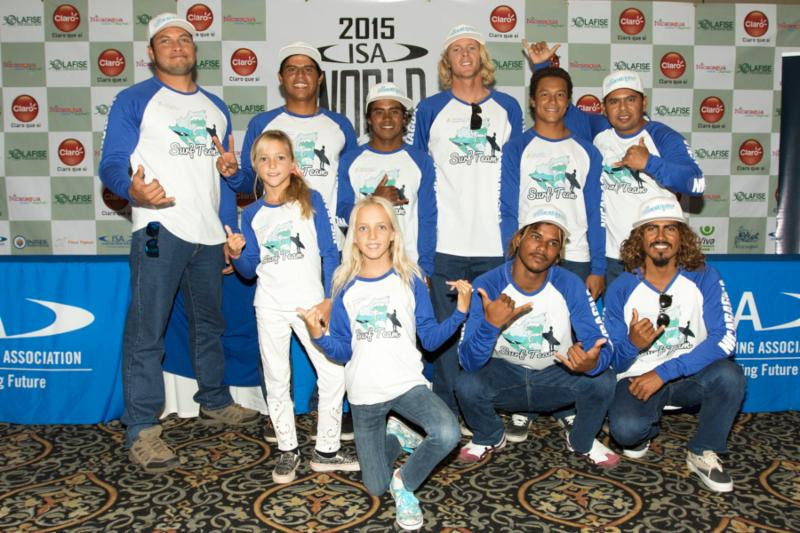 The 2015 ISA World Surfing Games is a team competition with individual Men's and Women's divisions. Each National Team includes 4 Open Men's and 2 Open Women's competitors.